When this mum arrived home recently, her family and friends were having a ball – quite literally. 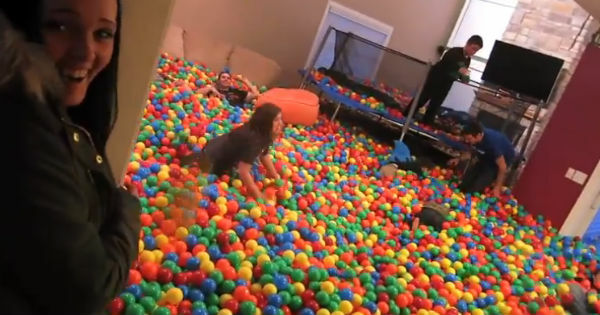 Her partner had turned their entire living room into a massive, ball-filled play pit. Cue a truck arriving at the house, full of colourful plastic balls. Roman, his children, family and friends then set about putting up a trampoline and emptying about 250,000 balls into the room. They then reap the rewards of their hard work by frolicking and surfing in the balls and jumping off a second-storey landing on to the trampoline and into the 75cm-deep pit. Before Brittney comes home, they blockade the door with balls – which then stream out as she opens it, almost knocking her to the ground. Her reaction? It’s not the first prank she’s been subjected to, but it’s safe to say it may be the most fun one. “Let’s play!” she says, after the initial shock wears off. And the clean-up? Not as much fun, but they do eventually work out a way to get it done a bit quicker – take a look at the behind-the-scenes video.